The PalletPal rotator inverter from Southworth Products Corp. 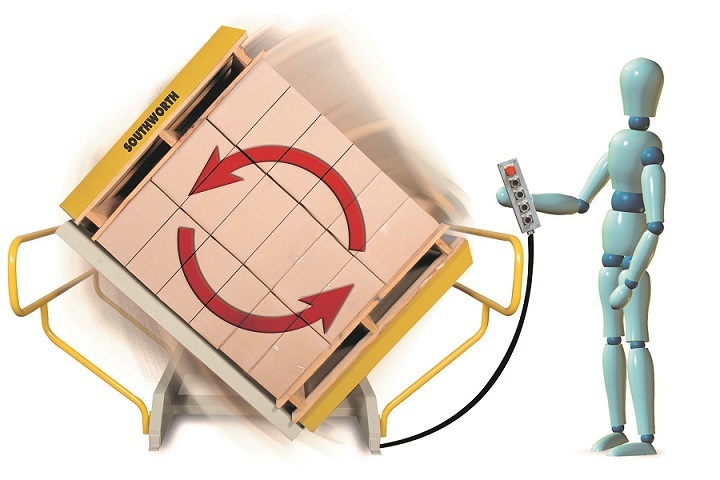 The PalletPal rotator inverter from Southworth Products Corp. is a fast, safe, and easy way to invert a fully loaded pallet without the need for labor intensive, time-consuming manual restacking. The most common use of the PalletPal rotator inverter is for switching loads from in-house pallets to shipping pallets or slip sheets. Other uses include replacing broken pallets, replacing damaged boxes or bags (at the bottom of the load), or turning inventory for mixing. Models are available with a load capacity of 4400 lb and clamp openings to accept pallet loads as large as 48 x 48 x 84 in.